Want the sun version or a pair of mismatch instead? Find them on our shop alongside co-ordinating earrings! A pair of bohemian earrings are an essential for every hippie's jewellery collection. 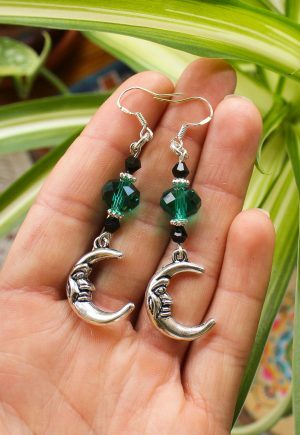 These are made using teal and black crystals and boho silver tone findings with silver plated hooks. Each pair is lovingly handmade by Mama Adorned to a high standard. Costume jewellery, please keep away from water and sprays and store in a jewellery box. Other colours and gold version available on our shop. 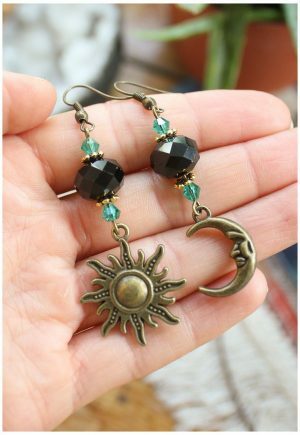 Mismatch celestial moon and sun earrings with teal faceted crystal. Designed and made in house by us! Dress them up or down, these will take you from day to night. Lightweight and so easy to wear, our customers always tell us how much they love wearing these. Matching necklaces available. 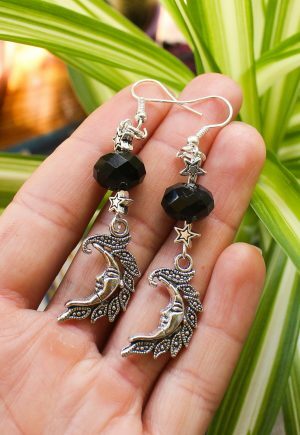 These boho-beautiful celestial earrings have been one of our most popular designs for over two years. 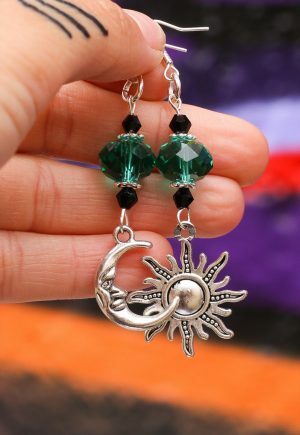 Each pair are made by Margarita using peacock metallic crystals, with silver moon and sun charms. Perfect for every day wear as they're nice and light, or for evening outfits. These beautiful hoops are deadstock vintage, over 20 years old. Brand new and unused, made from a medium weight silver tone coated brass metal which. Ideal for every day wear. All jewellery comes gift-wrapped where possible.